U.S. Rep. C.W. 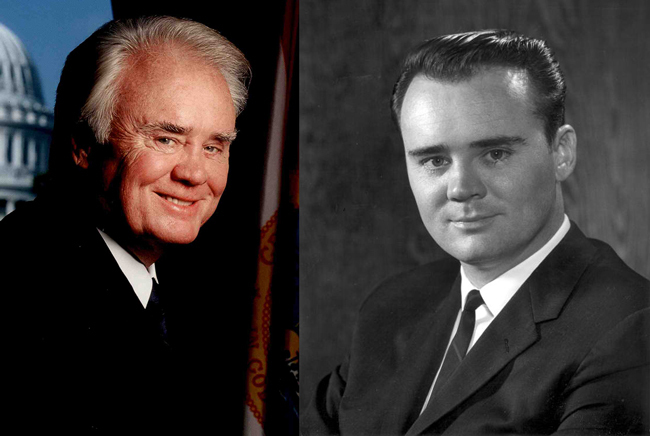 Bill Young, then and now. U.S. Rep. C.W. “Bill” Young of Pinellas County, the longest serving Republican in Congress, died Friday, according to his family. Young, who had recently announced this would be his last term in Congress, was 82. Young, was a political icon in the Tampa Bay area, having been elected to represent Pinellas County in Washington in 1970. He was chairman of the House Appropriations Committee in the late 1990s and early 2000s, a position he used to steer hundreds of millions of dollars to Florida and his district and to boost defense spending. Young’s son family announced his death, and Young’s chief of staff, Harry Glenn, told The Associated Press that Young died at Walter Reed Medical Center, where he had been for nearly two weeks. Young was suffering from back pain that has plagued him since a plane crash in 1970. Young had only announced earlier this month that he wouldn’t seek a 23rd term in Congress next year. A Harmarville, Penn. native, Young moved to Florida as a teen after his father abandoned the family. He dropped out of St. Petersburg High School to support his mother, and after a stint in the Army National Guard, he went into the insurance business. He also worked as an aide in the late 1950s to U.S. Rep. William Cramer. Several people who knew him said Young had the warm charm of a Southern gentleman, even in an era when politics got progressively less charming. Young’s imprint on Florida politics began when he was elected to the Democrat-dominated Florida Legislature in 1960. As the lone Republican in the Senate, he became the chamber’s default Minority Leader. Tom Slade, a former chairman of the Republican Party of Florida, was among a batch of newly-elected Republicans who joined Young in the Senate in 1966. “He did a very, very good job of taking a group of absolute neophytes and molding us into a very effective little Republican body,” Slade said. Young was onboard Slade’s campaign plane in 1970 traveling from a St. Petersburg fundraiser to Tallahassee on a foggy night when the plane crashed. Slade said he kicked out the emergency door, got his young wife out and then helped Young and the badly injured pilot out of the plane. Young had crashed into the windshield, Slade recalled. “It was like somebody cut his head open with an axe. I don’t see how he lived through it. The pilot had 70-some fractures and broke both his legs backwards,” Slade said. The harrowing experience drew the two men closer together, Slade said. As the powerful chairman of the Appropriations Committee, Young steered hundreds of millions of dollars in defense spending to Florida, especially to Tampa Bay where, thanks to Young, the defense industry became a major part of the region’s economy. Pasco County Tax Collector Mike Fasano, a New Port Richey Republican who served nearly two decades in the Florida Legislature during Young’s tenure in Congress said the region didn’t have near the defense presence it does now. With Young at the helm of the House budget committee, military and defense industry spending in Florida put the military’s influence on a par with the two previous economic drivers — agriculture and tourism. He has been credited with keeping MacDill Air Force Base in Tampa from closing in the early 1990s, and for bringing the U.S. Central Command to the area as well. “Bill Young did that. He did it on his own,” Fasano said. But his reach went much farther. Young brought home hundreds of millions of dollars more in transportation funding that helped build the overpasses on U.S. 19, the major thoroughfare connecting St. Petersburg, Clearwater and Tarpon Springs. The infrastructure was instrumental in building both the area’s tourism industry and overall development, Fasano said. Young also was behind the creation of what is now St. Petersburg College but began as a two-year community college. “He was one of the nicest people, one of the nicest politicians, one of the nicest public servants I’ve had the pleasure of working with,” Fasano said. Although Young was considered a conservative when he first went to Congress more than four decades ago, by today’s standards the politician would be considered a moderate. Fasano called him “the kind of politician we don’t see much of anymore” and compared him with GOP idol Ronald Reagan. Politicians from both sides of the aisle praised Young on Friday, with several noting Young’s politeness and charm. “As Florida’s longest serving member of Congress, Bill will be remembered as a true statesman and champion for the Tampa Bay area,” Gov. Rick Scott said in a statement. “He served with eight US Presidents throughout his career, always putting the families of Florida first, and working across the aisle to find solutions. “His work to support military families, our veterans, and his own service with the Army National Guard and as a reservist, will leave a lasting legacy,” Scott said. Scott will have to call a special election to fill the vacancy created by Young’s death. The district has gotten more competitive in recent years and the race to replace Young had already been generally thought to be toss-up between the two parties by most political observers. Young is survived by his wife Beverly and three adult sons, Rob, Billy and Patrick.